Brocade MLXe-16 AC system with one MR2 (M) management module, two high-speed switch fabric modules, one 1,800 W AC power supply, four exhaust fan assembly kits, and air filter. Power cord not included. Brocade MLX Series core routers deliver unprecedented scale and performance, high reliability, and operational efficiency for the most demanding service provider and enterprise networks. Built on a programmable architecture with high-density 100 Gigabit Ethernet (GbE), 40 GbE, and 10 GbE routing, these routers meet massive bandwidth demands, while maximizing ROI. Leading OpenFlow 1.3 scale in hybrid port mode provides a seamless transition to SDN for increased network agility and programmatic control. As almost every aspect of the world becomes digitalized and data, no matter what type, moves to the cloud, the interconnections between data centers, sites, and users are more critical than ever. The traffic patterns on those interconnections, within the data centers and on the campus network, are significantly different than they were 10 or 15 years ago. This means the requirements of the networking devices have been completely transformed and will continue to change at a rapid rate during this momentous sea change. As a result, network operators need solutions that can provide programmability, scale, and operational simplicity, enabling them to adapt and grow their network quickly. They will not only realize better TCO, but also unlock true ROI from the network for their business. The Brocade MLX Series was designed to perform the pivotal routing function at and between cloud data centers and the end user. Built with a state-of-the-art, sixth-generation programmable architecture and terabit-scale switch fabrics; the Brocade MLX Series helps service providers and enterprises meet massive bandwidth demands, achieve greater virtualization, and provide high-value cloud-based services using less infrastructure—thereby simplifying operations and reducing costs in the data center. Carriers, Internet Exchange Points (IXPs), transit providers, and high-performance research networks also rely on these routers for their backbone networks to meet skyrocketing traffic requirements and reduce the cost per bit. Moreover, the Brocade MLX Series can reduce complexity in campus networks by collapsing core and aggregation layers, as well as providing connectivity between sites using MPLS/VPLS. Software-Defined Networking (SDN) promises to provide an agile network for specialized service delivery. The Brocade MLX Series provides a seamless transition to real-world SDN with support for OpenFlow 1.3 in true hybrid port mode. This unique capability provides a pragmatic path for enabling network operators to integrate OpenFlow into existing networks, giving them the programmatic control offered by SDN for specific flows while the remaining traffic is routed as before. Today’s organizations also face a wide range of data privacy challenges, from cyber attacks and third-party snooping on private networks, to compliance requirements and growing demand for premium, secure services. Ensuring data privacy throughout the network is therefore imperative as organizations seek to enable secure operations while increasing growth, productivity, and profitability. The Brocade MLX Series provides inline encryption capabilities at wire speed, ensuring data privacy without compromising performance or requiring complex deployments. 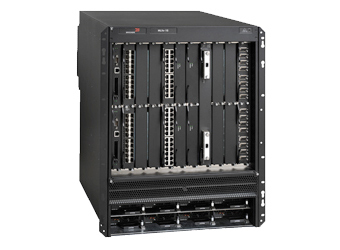 The Brocade MLX Series operates seamlessly under the Brocade Vyatta Controller. This controller is a quality-assured edition of the OpenDaylight controller code supported by an established networking provider and its leaders within the OpenDaylight community. The Brocade MLX Series provides a wide range of leading-edge Ethernet modules for 1 GbE, 10 GbE, 40 GbE, and 100 GbE that enable organizations to use a single platform for many applications. Dimensions (WxHxD) 17.20 in. X 8.71 in. X 23.0 in. (43.69 cm X 22.12 cm X 58.42 cm) 17.45 in. X 6.96 in. X 22.5 in. (44.32 cm X 17.68 cm X 57.15 cm) 17.20 in. X 12.21 in. X 24.0 in. (43.69 cm X 31.01 cm X 60.96 cm) 17.45 in. X 12.21 in. X 22.5 in. (44.32 cm X 31.01 cm X 57.15 cm) 17.20 in. X 24.47 in. X 24.18 in. (43.69 cm X 62.15 cm X 61.42 cm) 17.45 in. X 24.47 in. X 25.5 in. (44.32 cm X 62.15 cm X 64.77 cm) 17.45 in. X 57.75 in. X 26.88 in. (44.32 cm X 146.69 cm X 68.28 cm) 17.45 in. X 57.71 in. X 24.1 in. *Note: All certificates can be found at the Anatel Web site. For regulatory purposes, the Brocade MLX-4 and NetIron XMR 4000 are identified by model number BI-RX-4; the Brocade MLX-8 and NetIron XMR 8000 are identified by model number BI-RX-8; the Brocade MLX-16 and NetIron XMR 16000 are identified by model number BI-RX-16; and the Brocade MLX-32 and NetIron XMR 32000 are identified by model number BI-RX-32.